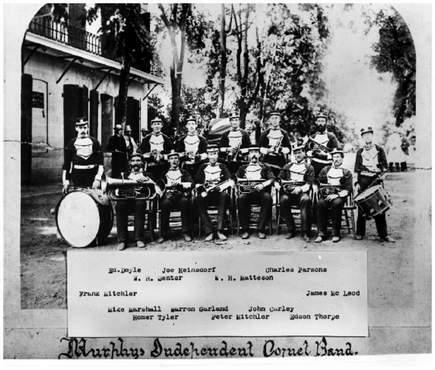 The Calaveras Community Band traces its history to the days following the Gold Rush. Men would brush away the grime of the mines, put on a uniform, grab their horns and entertain the crowds at many public functions. Creating music brought extra meaning to their lives and provided a counterpoint to the stresses of the day. In those times we were known as the Angels Camp Miners Band, the Murphys Independent Cornet Band, and dozen other names as the years passed. The Calaveras Community Band continues with this honored tradition for the 2015 Concert Season. While most of today's members aren't gold miners, we come from many walks of life. The age range of our group nearly spans a century itself, from 12 - 90 years young. But the spirit remains the same – we are people who love to play, performing for those who enjoy listening. Music is a very important part of our lives and playing in the band is a magical time. The Calaveras Community Band is a non-profit corporation and your donations are tax deductible under Federal and State laws as a 501(c)3 tax exempt organization. The CCB is funded in part by a grant from the Calaveras Community Foundation. These funds help us purchase new music, cover concert venue fees, and publicity.